River Rock Casino Resort’s proximity to the Pacific Ocean and easy access to Richmond’s farmland is reflected in the diverse culinary options offered on site. 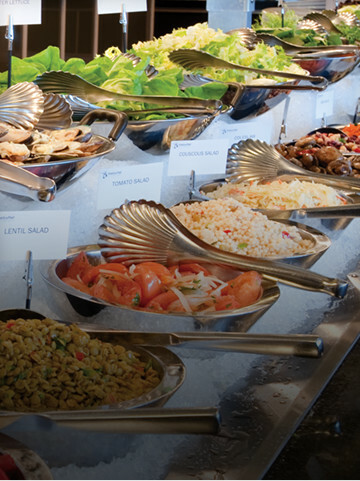 The resort’s dining offerings include The Buffet, a brand new food court, and award winning Sea Harbour Chinese Restaurant and Tramonto Restaurant as well as Starbucks Café and Curve lounge. River Rock Casino Resort is a proud partner of Richmond Sharing Farm. Inspired by the latest in West Coast cuisine, with an expansive wine cellar and stunning views of the Fraser River and Island Mountains, Tramonto is an elegant and intimate dining experience. Our chefs work with local farmers, fishmongers, butchers and artisans to create exceptional dishes and an eco-conscious menu. Our polished, five-star service will ensure that your business dinner, romantic meal or family occasion is an evening to remember. Tramonto also features a private dining room with seating for 18 guests – the perfect setting for an exclusive, intimate event. An inspired selection of everyone’s favourite flavours. The patio at Curve is one of Vancouver’s best-kept secrets, and offers an extraordinary setting to enjoy our signature cocktails, craft beers and expertly selected vintages. Pair your drinks with our light, unique dishes, and share a moment with friends in this stylish waterfront restaurants with intimate seating and superior service. Four quick-service dining options including Chopsticks Noodle House, Roch House Burger & Fries, Zio's and Number 3 Restaurant. Experience fresh West Coast seafood in this award-winning contemporary Chinese restaurant, offering authentic Cantonese dim sum, lobster, crab, clams, and oysters, and much more.